Instead of the old Garrett ACE 150, 250 and 350 metal detectors, a new series has been released: meet ACE 200, 300 and 400. The old series of metal detectors has been on the market for 10 years, and it was so popular (Garrett ACE 250 is one of the most demanded metal detectors on Amazon.com) that Garrett decided to update it. All new metal detectors have new features, but the main update is a VDI target discriminations (compared to older metal detectors which lacked those). Garrett ACE 200 and Garrett ACE 300 are some of the best models for newbie treasure hunters. Garrett ACE 400 is the best model of the series, but it will be more handy for experienced hunters. All three variants, though, are good for search of ancient relicts, coins, and jewelry. The only common disadvantage of the series is no option for underwater search, as the shaft can be submerged only to the level of control box. However, for underwater search Garrett offers two other top tools – Garrett AT Max and Garrett AT Pro. The design of the metal detectors remains the same – the S-shaped shaft, consisting of three sections. The upper section is attached to a comfortable armrest, repeating the shape of the arm. In addition, the armrest has special openings where you can insert the fixing strap. The strap is included in the kit, so no need to purchase it separately. Also, the control unit is located on the shaft. Unfortunately, though, it is impossible to dismantle it, as the design does not suggest this option. But technically it is not necessary, since the folded ACE does not take much place and can easily fit into any travel bag. On the bend, there is a polyurethane handle of a very ergonomic configuration. It will be comfortable both for professional detectorists, and also for beginners not used yet to long hours of search. The middle shaft part is used for fitting the metal detector to the height of the operator. To adjust the height, it has ten openings that allow to smoothly change the length of the detector. Carbon fiber bottom shaft part provides reliable operation for several years. The upper shaft part is aluminum and is painted matt black by powder paint. All the shaft parts are connected with spring buttons, which facilitate the assembly or disassembly of the device. Each detail of the metal detector provides structural strength and prevents from unpleasant surprises. The coils are oval shaped, which ensures accurate search on different soils with different degree of surface contamination. Thanks to this, you can easily search even in places with a huge accumulation of iron debris. The coils are completely sealed, and therefore provide the opportunity to work on the beaches. But it is worth noting that the control unit is not sealed, and it cannot be immersed underwater. If the water gets there, the level of performance will drop instantly. The cable connecting the coil with control box has elastic and durable braiding, which should not be exposed to high temperatures and mechanical wear. The plug is equipped with a tap with a fixing thread that protects it from unwanted pulling out due to clinging to bushes and tree branches. All new Garrett ACE 200, 300 and 400 metal detectors have a new feature – VDI target discrimination. 4 AA batteries allow the metal detector to work continuously for up to 40 hours. It should be noted that if using the headphones, the operating time increases. The manufacturer recommends using alkaline batteries for Garrett ACE Series, as only they provide stability of the electrical pulse. On the back, the control box has the headphones output. In addition to decreasing energy consumption by the detector, they also give the operator many advantages – clear and variable signals when detecting an object of different size, and depth of location. External speaker does not give such clear signal, so it is better to work with headphones. To find a target, you need to constantly make the coil move from side to side. Once the detector identifies an object, it should be localized. To do this, reduce the strokes and make them in the cross direction. The metal detectors have three audible alert tones identifying the target. This means that the sound changes when different types of objects (iron, non-ferrous metals, silver, etc.) are detected. Garrett ACE 200, which has already earned the respect of beginners and professionals alike, opens the Garrett ACE series of metal detectors. The main difference from models by other manufacturers is that this detector has maximum functionality and excellent search capacity, so it can perform a variety of tasks. 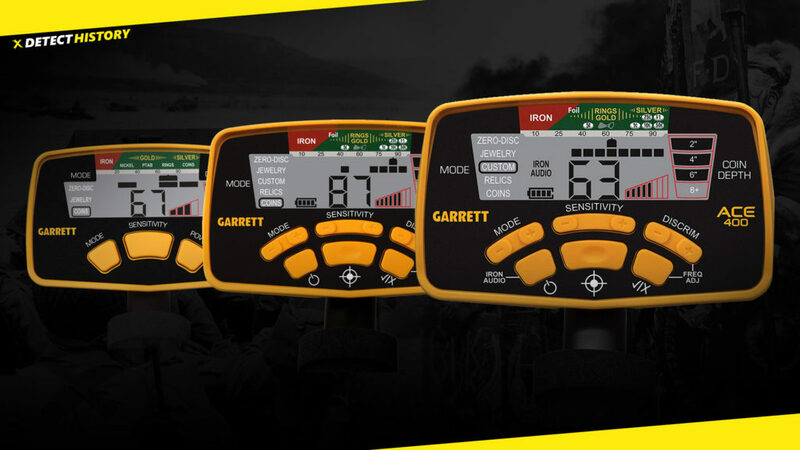 Garrett ACE 200 has a simple and clear display and control box. The liquid crystal display has only three touch buttons to adjust the detector. In the middle of the upper part of the LCD display there is an identification scale. During the search, it lights up and the cursor indicates the type of target. At the time of object detection, the data obtained can be compared with the sound response from the detected target. On the left side of the screen is a table with preset search programs. ACE 200 can operate in three modes: all metals, coins, and jewelry. The first is best suited for finding various relics in places of historical settlements. In particular, it is best to carry out search operations in areas where mass battles took place, as the coil informs the operator of any interesting potential finds. The remaining two modes allow you to exclude all iron objects and direct the search exclusively to non-ferrous metals. Switching modes is carried out by pressing the MODE button located under the scale. Garrett ACE 200 was created mainly for jewelry and coins, but still this device is universal. This detector can be used for searching ancient and military relics. The vertical scale on the right side of the screen indicates the depth (in inches) of the object. There is also a mark that indicates how to dig when extracting the find. In addition, the display has battery power icon. Thanks to it, you can monitor your power consumption at any time and determine when it is time to replace the battery. Also, Garrett ACE 200 does not have a pin-point mode, in contrast to Garrett ACE 300 and 400. Garrett ACE 300 metal detector is an excellent on-budget device, worth the money spent on it. This metal detector is an entry-level device with very positive characteristics. ACE 300 completely took over all advantages of its predecessor, Garrett ACE 250. Regardless of the totally affordable price, this metal detector can adequately search valuable finds and reward even complete newbies. It’s easy to use (in contrast to the majority of expensive metal detectors), because it does not have a lot of unnecessary settings. Just take it and go! This metal detector has many advantages. ACE 400 is the most powerful model in the ACE series, which has repeatedly been considered the leader of sales for several years, only occasionally giving the first place to their counterparts from the model range. Garrett ACE 400 is a symbiosis of reliability, excellent price and high performance. Structurally, this model is all the tighter base as its predecessors: lightweight, well-balanced, with movable construction units, and comfortable armrest. The design is durable and easy to transport. Garrett ACE 400 has DD 8.5×11″ PROformance coil and Zero-Disk mode that makes it stand out compared to ACE 200 and 300.